Find below an introduction to just a few of some of South Louisiana's main attractions. Cajun Sausage - (Boudin) - Boudin is a unique mixture of pork, rice and spices stuffed in a sausage casing. Whether served on a bun with a shot of mustard, a side of hot Cracklins or with, simply, an ice cold beer. You will not be disappointed with this cajun specialty meat. Get some today! Visit our E-Store and Shop Cajun! Cajun Catering Services - Looking for a Caterer!! We specialize in cajun cooking catering and crawfish boil catering but we can put a special menu together just for your event. Weddings, private parties or Business luncheons...Gotcha covered!. We travel most anywhere and can a little cajun flare or not to next gathering. 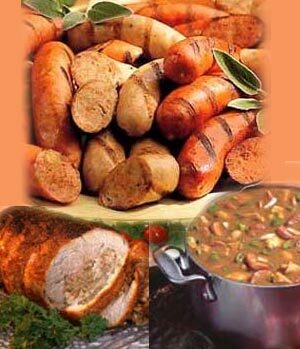 Cajun Smoked Sausage Andoullie -An all-time favorite specialty smoked meat product. 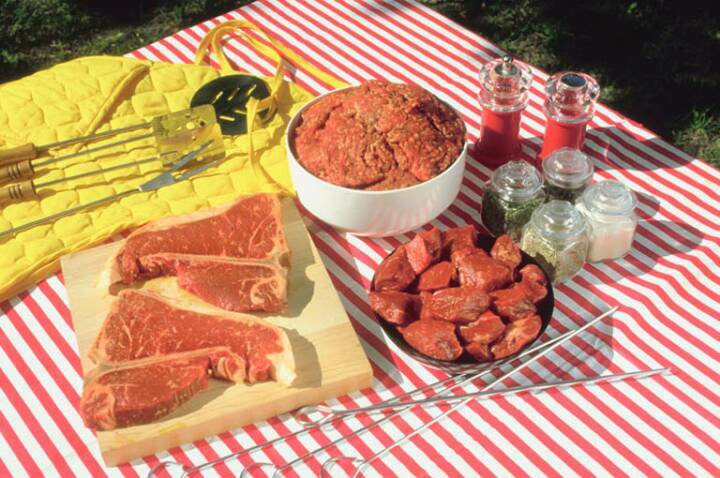 Andoullie sausage is most commonly used to compliment a Gumbo or a backyard BBQ. What makes Andoullie sausage unique is the coarseness of ground pork and the larger diameter of the link. This sausage can be quite spicy depending on whose cooking. Buy here today! Visit our E-Store and Shop Cajun! Cajun Cracklins -I believe everyone at one time or another has snacked on a bag of fried pig skins or pork rinds. Cracklings fall in this category of snack foods. It is a innovative type of cajun food that begins as a labor of love. Preparation is brutal and messy. Fried Crispy and seasoned to perfection! Tasso Ham - Oops!! We donn-it again! An wonderful creation I call Cajunized ham. It is a pork cutlet taken to a new level. From household kitchens to 5 star restaurants, you will find spicy lean slow smoked tasso ham used to zest up many favorite dishes. Buy here today! Visit our E-Store and Shop Cajun! Cajun Food Recipes - Cajun Food Recipes - Louisiana favorites handed down for three generations, my recipes are tried and tested!! Mardi Gras King Cake - Try one for breakfast! Everyone will love the treat. Many flavors to choose from. Dry Rub Seasoning Cajun - I simply call it Chad's All-Out Cajun Seasoning (Custom Blended) - The last Dry Rub Seasoning you will evr need! Great for all cuts of meat, including Chicken, Pork, Ribs, Steak or Beef. Visit our E-Store and Shop Cajun! Cajun Crawfish Seasoning - Chad’s Cajun Crawfish Seasoning is true and tried for crawfish boils, crab boils, shrimp boils, seafood boils and many other dishes. Checkout our Crawfish Boil Gift Bag . Buy here today! Visit our E-Store and Shop Cajun! Cajun Cooking - Cajun cooking is partly technique and a little of one's personality imparted into the dish. My Cajun recipes highlight the techniques and the culture that make Cajun food recognizable among so many. Crawfishboil rentals Louisiana cooking techniques rely heavy on the equipment side of the kitchen, partically cast iron which has stood the test of time in these parts. Many cajun recipes call for the use of a black pot. You will find rental information here on my site about unique pieces of equipment designed to complement cajun cooking. Crawfish Catering - It just would not be fair to leave out the crown jewel of Cajunville, Louisiana – cooking crawfish. I’ll show you here on this site my crawfish recipes, especially dem’ crawfish boils. Hopefully you would be inspired to try it yourself. If not HIRE ME! After being in the catering business 15 years, We know how to get it done. I have created this site as a compliment to those who have traveled or lived here in Louisiana and would like to rekindle the adventure and discover again the joy of Cajun food recipes and cuisine. I hope you will find the information provided here useful and/or the products you may be looking for. So spice it up and buy cajun food ! founded on culture and tradition. What you’ll find in foodchoices are not always familiar, but once tried, everyone wants to adopt some part of it and take it home. Cajun food is quite unlike the typical dishes found in most homes and eateries in other states. In tourist areas you’ll find restaurants with familiar names and Cajun menus, though the offerings will be substandard and probably overpriced. To experience the real deal you will have to do your homework or travel down south . South Louisiana that is, where we are well-known for producing some of the most culturally unique cajun creole food dishes and products anywhere. Look for the big pots, hot spices and soiree's and there you will find the best cajun cuisine. Family is at the heart of Louisiana cooking and we gather as often as possible with our big pots and favorite vittle. There are plenty of pseudo cajun recipes floating on the net. Looking for a Cajun Caterer or Crawfish Boiling Services?